jfk clothes clothing photo back coat bullet hole picture. 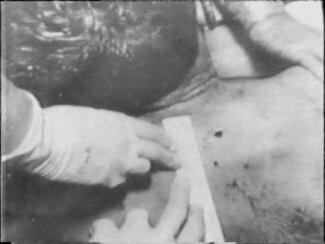 During the autopsy another bullet wound was observed near the base of the back of President Kennedy's neck. Commanders Humes and Boswell agreed with Colonel Fincks testimony that this hole-is a wound of entrance. The basis for that conclusion is that this wound was relatively small with clean edges. It was not a jagged wound, and that is what we see in wound of entrance at a long range." Concluding that a bullet passed through the Presidents neck, the doctors at Bethesda Naval Hospital rejected a theory that the bullet lodged in the large muscles in the back of his neck and fell out through the point of entry when external heart massage was applied at Parkland Hospital. In the earlier stages of the autopsy, the surgeons were unable to find a path into any large muscle in the back of the neck. At that time they did not know that there had been a bullet hole in the front of the Presidents neck when he arrived at Parkland. Commander Humes, who believed that a tracheotomy had been performed from his observations at the autopsy, talked by telephone with Dr. Perry early on the morning of November 23, and learned that his assumption was correct. This confirmed the Bethesda surgeon's conclusion that the bullet had exited from the front part of the neck. 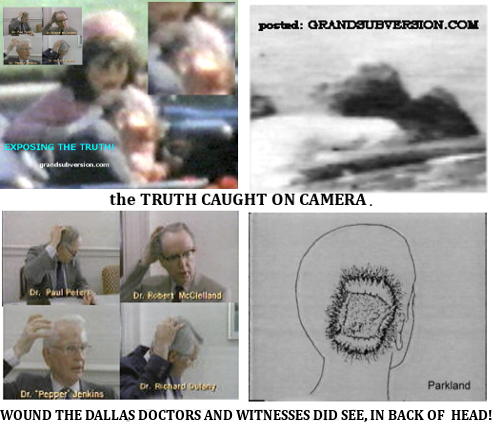 Dr. HUMES stated that the pattern was clear that the one bullet had entered the Presidents back and had worked its way out of the body during external cardiac massage. In the Bethesda autopsy report. The back and neck wounds would be described as presumably of entrance and presumably of exit. This wound was never fully tracked. At this point I will simply repeat the testimony of Parklands Dr. Carrico. Q. Based on your observations on the neck wound alone did you have a sufficient basis to form an opinion as to whether it was an entrance or an exit wound. During the course of the Autopsy the surgeons were informed that a bullet had been found at Parkland Hospital. jfk bullets found recovered kennedy autopsy how many. Just the finding of this bullet posed a problem for the Commission, but they would solve this problem the same way they would if any one or any thing got in the way of their lone assassin theory. A hospital attendant wheeled the empty stretcher into an elevator. Shortly afterward, Darrell C. Tomlinson, The hospitals senior engineer, remove this stretcher from the elevator and placed it in the corridor on the ground floor, alongside another stretcher wholly unconnected with the care of Governor Connally. A few minutes later, he bumped one of the stretchers against the wall and a bullet rolled out. Although Tomlinson was not certain whether the bullet came from the Connally stretcher or the adjacent one, the Commission has concluded that the bullet came from the Governor's stretcher. That conclusion is buttressed by evidence, which eliminated President Kennedys stretcher as a source of the bullet. Tomlinson is adamant that the bullet He found WAS NOT on the Stretcher he had just removed from the elevator. 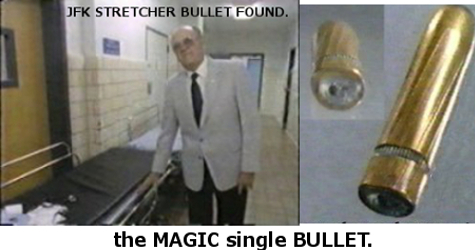 Kennedy jfk bullet recovered found stretcher Magic Single Bullet Section. 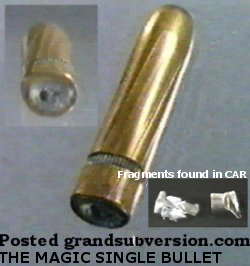 magic Single BULLETS FOUND were was. 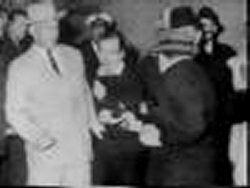 Seth Kantor who was part of the press pool covering the trip, had been a reporter in Dallas and was familiar with Jack Ruby. "I saw jack Ruby and spook with him and shook hands with him, some distends away in the hospital as I was on my way to the press conference." *** "He was in Parkland Hospital. ***...""He was obviously under emotional strain." The Warren Commission would say, Kantor was Confused, And believed that it was late that Friday night at the Dallas Police Department that Kantor talk to Ruby. 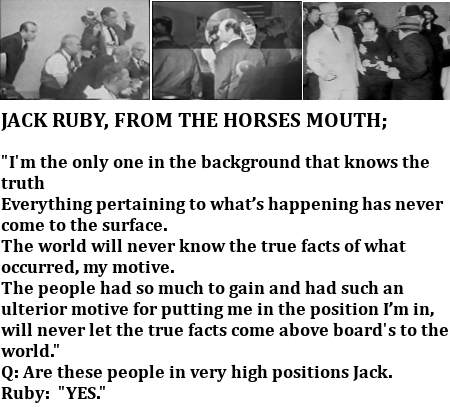 YA THAT JACK RUBY PAGE. 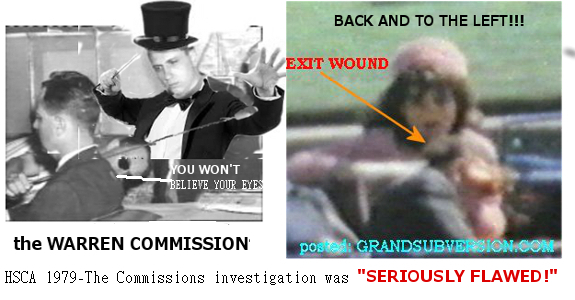 autopsy of jfk kennedy throat bullet wound conspiracy shot from front or back? 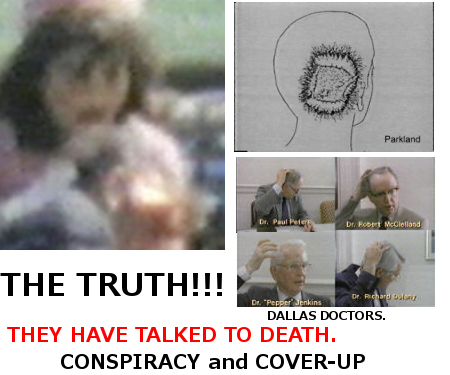 From Dallas Doctors Descreption of the Throat Wound the HEAD AND THROAT WOUND PAGE. When the Presdent Arrived at Parkland. Mr. SPECTER. Will you continue, then, Dr. Perry, as to what you observed of his condition? Dr. PERRY. Yes, there was blood noted on the carriage and a large avulsive wound on the right posterior cranium. I cannot state the size, I did not examine it at all. I just noted the presence of lacerated brain tissue. In the lower part of the neck below the Adams apple was a small, roughly circular wound of perhaps 5 mm. in diameter from which blood was exuding slowly. I did not see any other wounds. [ BACK ] AUTOPSY PAGE (3) Dallas Doctors DESCRIPTION of the HEAD WOUND [ NEXT ] Final page (5) jfk kennedy autopsy and x-rays medical evidence. Page (1.) 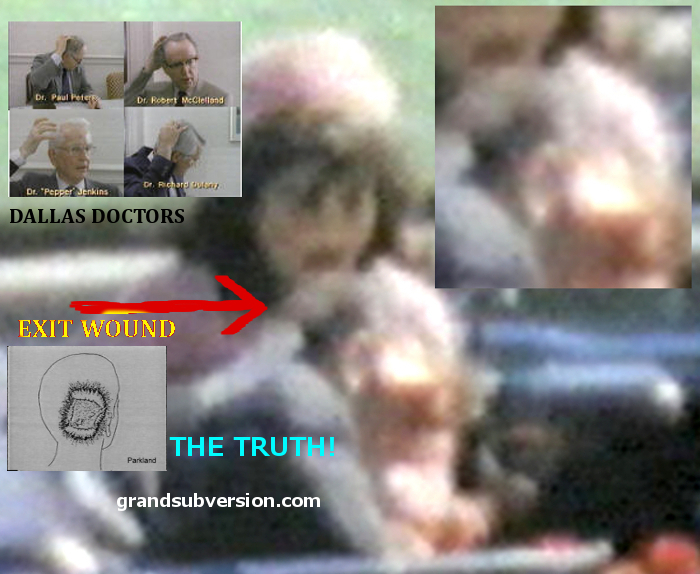 JFK AUTOPSY, PHOTOS and more on the HEAD WOUND. JFK AUTOPSY photo doctors report results zapruder film headshot brain wound injury head shot conspiracy john f kennedy assassination. JFK ASSASSINATION KENNEDY HEAD SHOT AUTOPSY CONSPIRACY EVIDENCE THEORIES COVER UP JOHN F WOUND BRAIN INJURY PHOTOS X RAY GUNSHOT PRESIDENT. 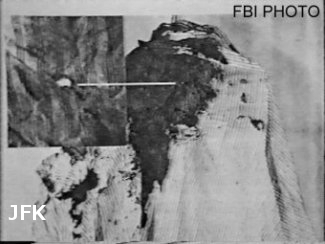 [ BACK ] Dallas Doctors DESCRIPTION of the HEAD WOUND [ NEXT ] Final page (5) jfk kennedy autopsy and x-rays medical evidence. 1 Arrival and treatment at Parkland Hospital. grandsubversions.com NEW Grassy Knoll ENHANCEMENTS. Moorman photo. Black Dog Image. Knoll Overview. Gordon Arnold Factor. CLICK IMAGE FOR ENHANCEMENT PAGE. Some of the FACTS: CLICK IMAGE for the REST OF THE STORY. 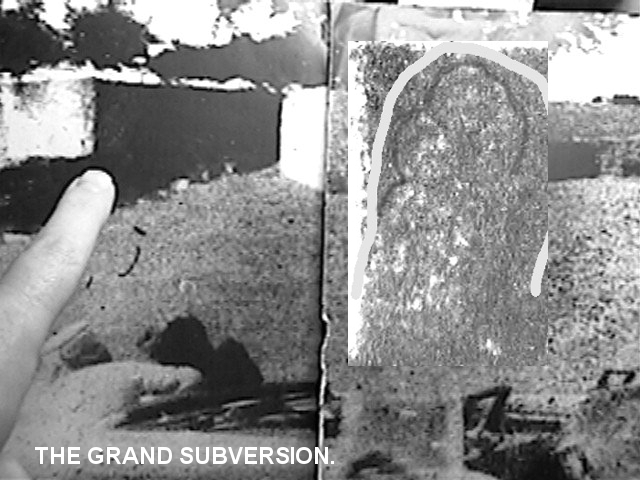 Grand Subversions "The world will never know the true facts of what occurred " "I think history will deal with much more then we're able to now." President Kennedy was probably killed as a result of a conspiracy. jfk assassination photo john f kennedy assassination AUTOPSY PAGE (1). 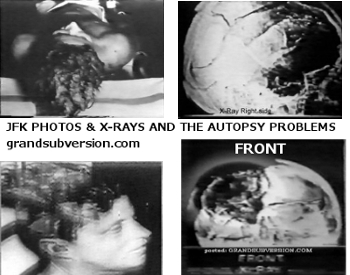 jfk autopsy photos and x-rays kennedy assassination. JFK john f Kennedy Assassination Autopsy photos pictures gunshot fatal wound head shot blowing off back brain injury. 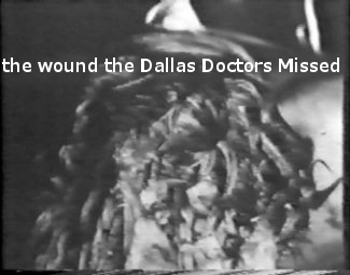 Dallas Doctors Descreption of the Throat Wound page. JFK AUTOPSY PHOTOS Page (1.) and more on the HEAD WOUND. conspiracy theories 911 ufo moon landing Elvis area 51 photo jfk Kennedy new evidence facts proof csi crime scene conspiracy of silence book.